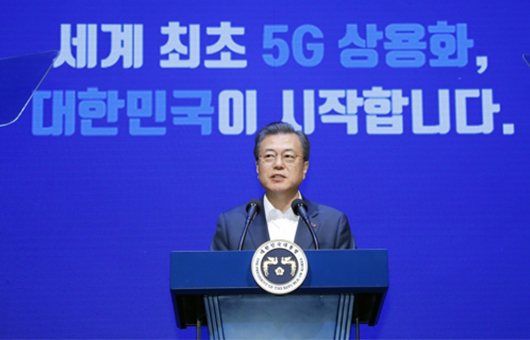 The South Korean government hopes to capitalize on Korea’s head start in 5G migration through promotion in smart and automation industries to achieve a goal of adding 600,000 jobs and generating 180 trillion won ($157.5 billion) in service output and $73 billion won in exports by 2026. The Ministry of Science and ICT and 10 related departments held Korean 5G Tech Concert on Monday to unveil a strategy dubbed 5G+ that is aimed at boosting 5G-based new industries and services through leadership in 5G era as the first country in the world to launch 5G communications network last week. The government will implement a two-stage project to promote five sectors – virtual reality contents, smart factory, autonomous driving, smart city and digital healthcare. At the first stage, it will test ‘killer’ services of each sector, and make them widely available at the second stage. It will develop 5G-connected telemedicine medical system to enable prompt first aid treatment for patients with extreme injuries or heart attack by 2021, which will be applied to about 20 percent of emergency treatment centers across the globe by 2025. To promote the autonomous driving industry, it will develop and test drive 5G-based autonomous driving shuttles in some parts of the country by 2020 and supply more than 1,000 units of self-driving buses by 2025 to each local government. Separately, the government selected 10 sectors to nurture based on 5G network, including next-generation smartphone, network equipment, edge computing, security, vehicle to everything (V2X), robot, drone, CCTV, wearable device and AR•VR device. It will set up a real-time monitoring system on roads, at ports and airports by using robots and CCTVs by 2020 to step up support and promotion of the industries.